Red Arrows to Headline Farewell Wings & Wheels this Father's Day - Military Airshows News & Press Releases. 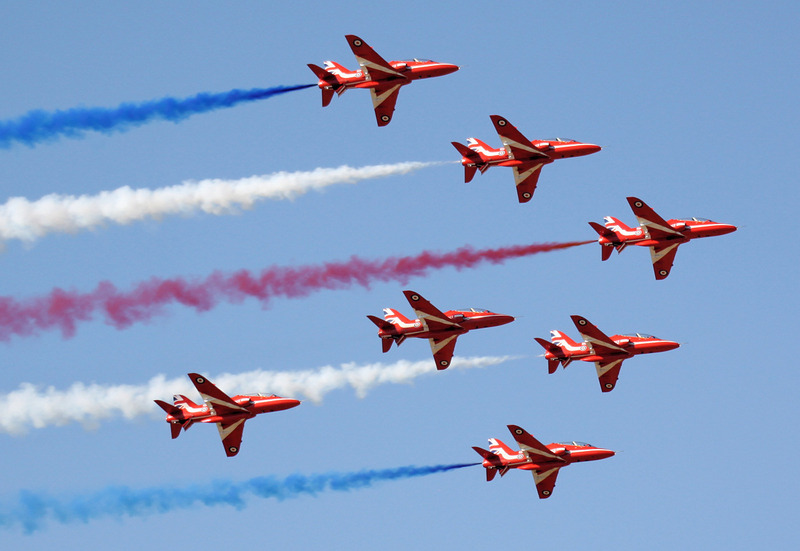 Wings & Wheels is delighted to confirm the Red Arrows will be headlining the air display on Saturday 15th and Sunday 16th June (Father's Day) as the team returns for the fifteenth and final airshow at Dunsfold Aerodrome in Surrey. The Wings & Wheels team has taken the decision to celebrate and go out on a high in their old June spot and bid farewell with the nine-aircraft formation, officially known as the Royal Air Force Aerobatic Team, taking centre stage. Jamie McAllister, Event Director comments: "It is a special year, tinged with sadness, as we celebrate returning to our original June spot for our fifteenth event having made the decision to make this our last but greatest show. We are thrilled the Red Arrows will be headlining Wings & Wheels before heading off on their North America tour over the summer. It has not been an easy decision to say goodbye to Wings & Wheels but, like other airshows, it has been challenging to keep putting on the best airshow we can in the current aviation and economic climate. We hope all our loyal visitors will join us in our final hurrah - we are going to make it a good one!" The role that is at the heart of the Red Arrows is to inspire people of all backgrounds and ages through a display of speed, agility and teamwork. Just like those personnel at other Royal Air Force units, the 120 people who make up the entire Red Arrows team are highly-skilled individuals who are all motivated in the pursuit of excellence. Flying the distinctive Hawk jets, which flew off the production line at Dunsfold Aerodrome in 1974 in the hands of the late Duncan Simpson, the Hawk is the Royal Air Force's advanced trainer and has been used by the Red Arrows since 1979. The squadron is renowned across the world for displaying in the British-built fast-jets. The first half of the Red Arrows' display consists of synchronised, formation aerobatics, followed by a more dynamic second half. Reds 1 to 5 form the front section of the team's formation, known as Enid, and Reds 6 to 9 make up the rear part, called Gypo. The Synchro Pair, Reds 6 and 7, perform the highly-popular opposition manoeuvres during this latter section of the show. During a display, Red 10 acts as the team's Supervisor who maintains two-way radio contact with the Team Leader. He also provides the commentary. Visitors to Wings & Wheels can also enjoy other air displays in a five hour show, accompanied by witty and knowledgeable commentary from aviation experts and display pilots. More display announcements will be made in April. The 'Wings' of the event would not be complete without a close-up inspection of all the weekend's visiting aircraft including Dunsfold's resident Boeing 747 in the 'Wings Park', the Brooklands VC10 and Aces High DC3, all open for tours. Supercars and classic and vintage icons put on an awe-inspiring display of power and speed on the Top Gear track in a 2 hour auto spectacular. The 'Wheels' of the show includes displays from McLaren 12C, Lamborghini Aventador Roadster and Huracan, Pagani Zonda, Ferrari California T, Aston Martin Rapide, Dodge Monaco, TVR Tasmin 280i, Ducati Multistrada 1200s, Ferrari F355 Berlinetta, Ford GT40 and Lotus Elise. Visit the Wheels Zone with a bigger and better crowd line parade and interactive displays from car and motorbike clubs. The Military Zone & Parade is interactive and explosive bringing re-enactors in a living history zone and our popular military vehicle parade. The Zone has over 80 military vehicles, six re-enactment groups, tank rides, as well as the history of Dunsfold Aerodrome and Army, Navy and RAF recruitment stands for everyone's enjoyment. Sid's Zone is an action packed free area for the little ones. From 10:00 until 16:00 the kids can join in with colouring competitions, arts and crafts, paper plane challenges, face painting and the popular Sid's Trail which encourages the whole family to search the arena for questions and answers to win a goody bag. Meet and greets with show mascot Siddeley and the display pilots are not to be missed. The excitement and anticipation doesn't stop at the main displays as the 32 acre public arena is bursting with a huge variety of interactive attractions containing all you need for a great family day out. The show arena boasts go-karts, kit-plane demonstrations, aviation and motoring simulators, military outlets and displays, static aircraft, fairground and over 80 retail outlets selling a wide variety of products and gifts. Shopping in the arena includes a craft marquee full of tempting tea time treats to take home and craft gifts and a vintage village. Taking the hassle out of your day the show includes added extras to make your experience even more enjoyable; over 18 fixed-price catering outlets, two bars, hospitality facilities, free on-site parking, public camping, lost children point, disabled access, informative show commentary, opportunities to meet the pilots, official show merchandise and grandstand seating. The 15th annual Wings & Wheels will be held on Saturday 15th & Sunday 16th June 2019, at Dunsfold Park near Guildford, Surrey, and is open to spectators from 09:00 until 20:00. Advanced rate tickets from £24 for adults or £55 for a family. Single child tickets (for children aged 5 - 15) will be £8. Children under 5 go free. Hospitality packages start from £199 per person, weekend passes, grandstand tickets and camping are also available. For more information visit www.wingsandwheels.net or to book standard tickets call 08712 305 572.